Author: Joachim Crass. Series edited by: Hans-Jürgen Sasse †. 32 pp. Roman, 383 pp. 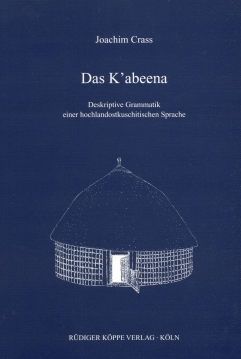 K’abeena is a Highland-East-Cushitic language spoken by some 35.000 speakers. The settling area of the people is located in and around the town of Wolkite, some 160 km south west of Addis Ababa. The closest related languages are Alaaba, Kambaata and T’imbaaro. The presented data were collected during four field stays between 2000 and 2003. The data are described by using structural and functional approaches. The language described in this book possesses several interesting and scarcely found features. On the level of phonology, a striking feature is the occurence of five whispered vowels. In two of the 13 inflexion classes of nouns, the whispered vowels are the only feature distinguishing case. Another important phonological feature is stress accent. All word classes have an unmarked position of the accent: e.g. one group of words have a wordfinal accent, others have the accent on the pre-final syllable of the word. K’abeena has the basic word order (S)OV, and is a marked nominative language, i.e. the unmarked case is the accusative (called absolutive by some scholars). This feature is typical for languages spoken in the south west of Ethiopia and adjacent areas. Of the other five cases the instrumental/comitative and locative are distinguished only with masculine nouns. The two main aspects perfective and imperfective are marked by vowels, while the progressive is formed analytically by a converb and an auxiliary verb. Most of the speakers of K’abeena are at least bilingual speaking Amharic and/or other languages like Chaha, Wolane or Oromo depending on the regional provenance. This bi- or multilingualism led to contact induced change, especially in the lexicon of K’abeena. Following the links below you will find further grammatical analyses on Highland East Cushitic languages, as well as paper collections and monographs published by the author. Das K’abeena verfügt über eine reiche nominale Morphologie – mit 14 Flexionsklassen und acht Kasus – sowie über eine vielfältige verbale Morphologie. Es ist dem Verf. gelungen, die zum Teil verwickelten Verhältnisse klar und stringent darzustellen. Das ist der funktional-strukturalistischen Methode, wenn auch mit wenigen generativen Einsprengseln geschuldet, für die sich der Verf. im Vorwort ausspricht. Das Buch ist eine faszinierende Lektüre für alle Kuschitisten und hoffentlich auch für viele Äthiosemitisten und allgemeine Sprachwissenschaftler.